This week marks the most important holiday of the Chinese calendar - the Lunar New Year. Millions of people in communities across the world will celebrate the occasion, which typically begins with the new moon occurring between the end of January and end of February. Members of Villa Maria Catholic Homes' Multicultural Wellness Centre celebrate Chinese New Year. With the latest Australian census showing that over 37 percent of people aged 65 and over are born overseas, celebrating cultural events can be difficult for seniors who may be seperated from family and friends overseas. Coordinator of Villa Maria Catholic Homes’ Multicultural Wellness Centre (MWC) in Melbourne’s east Rani Wong says recognising cultural events helps combat social isolation for culturally and linguistically diverse (CALD) seniors. “(Cultural events) are not celebrated here the way it would have been in their country of birth,” she says. MWC members are welcoming the Year of the Pig by creating and hanging decorations, performing traditional customs and coming together for the yearly ‘reunion lunch’. 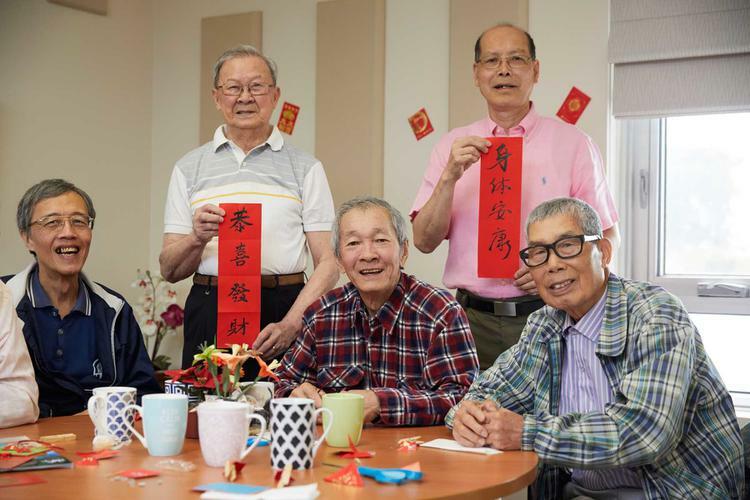 Every day of the week, seniors from Chinese, Filipino and Sri Lankan backgrounds connect to their cultural roots through activities at the centre, which was the first CALD-specific, integrated, aged-focused wellness centre in Victoria. Michael Liu and his wife Ann have been MWC members for three years. Michael says he’s made many friends and enjoys the exercise classes, especially Tai Chi. Due to language barriers and limited mobility, Ms Wong says most of the seniors attending the group were “house bound”. Residents at Marion and Craigmore locations have been busy creating Chinese lanterns, while at Paradise, Lifestyle Coordinator Thuy Pham will give a presentation on her Vietnamese culture and how they celebrate the occasion, touching on traditional dress and the ‘dragon dance’ performed in Chinese culture. ‘In recognising that many people come from other countries and have diverse backgrounds, Resthaven acknowledges special events in our leisure and lifestyle activities and group social programs,” Resthaven’s Multicultural Project Officer Priscilla de Pree says. “Our workforce is comprised of people from more than 50 countries and, currently, staff of Chinese heritage represent the fourth largest group of Resthaven CALD staff. “Residents are often genuinely interested in the cultural differences and backgrounds, so cultural events help encourage interactions with staff."